The local government of each selected city will be required to use Google Docs for all government documents, including memos, letters, water bills, spreadsheets, and tax bills. Every household and business that wants to get Google fiber will have to give Google a tax lien on their property that allows Google to take ownership of the property if the household or business uses Bing for online searches. All vehicle owners will be required to allow Google to attach a GPS device to their auto or truck to allow realtime tracking of what stores are visited. The device will have the ability to turn the car's engine off if the driver visits a business that does not purchase a minimum amount of Google Adwords advertising. Additionally, every vehicle will be required to have a bumper sticker that says, "Powered by Google." Every child in each community will receive an Android-powered tablet device at the age of two, and Google will provide a full suite of Google Docs so that the search company has access to everything the child does online from age two to eighteen. Google expects this will allow the child to benefit mentally from "enhanced search results." Every resident over the age of eighteen will be given a special Android-powered phone that works on the Sprint network, which will be purchased by Google to support the Community Fiber initiative. The special phones will record every conversation, text, and photo, and store them in special customer dossiers that will conveniently allow for "enhanced search results" to be delivered to phone owners. In cooperation with the Department of Homeland Security, Google will provide the Federal government with complete access to every bit of data collected via Google Fiber and Google/Sprint wireless networks. Google explained that this enhances public safety by allowing the FBI and DHS to identify criminals before a crime has even been committed, using new Google artificial intelligence engines that generate special "criminal minority reports" that will be transmitted daily to DHS. Google indicated that the company has no intention of forcing any community to agree to accept the wide range of services and infrastructure enhancements, so it has developed a special one step process that gives each community a democratic process for choosing participation. A voter referendum would be put on the ballot at the next local election which will state, "We agree to disband our local government, including all elected and appointed officials, and replace them with Google Fiber Initiative staff: YES/NO." If the referendum is passed, then and only then will Google build fiber infrastructure in the community. In the press conference announcing this on April 1st, Google officials conceded that the program "might not be a good fit for every community that applied." It was an easy decision. Kansas City is an electric city, so they own the poles. So no costly and long dragged out pole surveys, no make ready and no pole attachment fees, and the ability to take fiber anywhere in the electric service area at very low cost. I'm sure that Kansas City also offered to hang all the fiber using their electric utility crews and buckets trucks. No mystery here....it's a smart choice. I have always had the feeling that becoming an Amazon customer is a bit like joining the Borg: resistance is futile. But Amazon really does believe in customer service, and is particularly good at identifying trends and then developing services to meet the new market demand. Amazon is beginning a big push for their Cloud Drive service, which lets you upload files to an Amazon server and then access them from anywhere. In concept, it is no different that the file storage Apple has offered first via dotMac and now via MobileMe. But Apple has never paid much attention to MobileMe, and my own experience with MobileMe has been decidely mixed. MobileMe and Cloud Drive are both essentially virtual hard drives, and they differ from the backup services like Carbonite because backup services are not designed to provide routine access to your files. On the other hand, the backup services provide more tools to make sure everything gets backup regularly. Some people are going to use both, and some might settle for the virtual hard drive approach to save money. As I've been writing recently, cloud services are only as good as your broadband connection. The interesting thing about cloud-based virtual hard drives is that the big companies have no real advantage over a small firm with servers closer to customers. If I was starting a business, I'd be looking at something very different from the massive data centers Apple, Amazon, and Microsoft are building. I'd be looking at putting servers and services on community broadband networks and getting my cloud services as close as possible to my customers. Why? By doing so, I can provide better services at lower cost than the big guys. Via Fred Pilot at Eldo Telecom, Geoff Daily makes the argument that "all broadband is fiber." Geoff has it exactly right. Just yesterday, I met with a community leader who asked, appropriately, "What if we spend all this money on fiber and wireless turns out to be cheaper and better?" Daily reminds us that all wireless networks eventually dump their traffic onto fiber networks in order to work properly. If wireless were the solution, the backhaul for wireless networks would be wireless, not fiber. And we can take that even further, as the "little broadband" solutions of DSL and cable modem would not work at all if they did not aggregate their traffic onto fiber cables. Fiber is the future of economic development in America's communities. Economic developers and community leaders that ignore the importance of affordable, high performance broadband availability are putting their community's economic future at great risk. Death of TV, Part XXVII: ABC, NBC, CBS... and Netflix! The old TV empires are crumbling fast, and Netflix is speeding their demise. It just outbid all the other networks for a new original, uh, "TV" series called , which will star Kevin Spacey. Since you can watch Netflix on just about any device on the planet, there is even less reason to keep around one of those old timey television doohickeys. All they are really good for is as a large screen for your iPad 2, which does a great job of streaming live Netflix content in HD to them. More seriously, the big losers in all this are the cable companies. While Comcast furiously tries to close the barn door after the horses all bolted ages ago by trying to block Netflix, it will shortly become apparent even to cable TV execs that no one really needs them any more, unless the cable TV folks wake up and smell the coffee. And that rich aroma is open access. If the cable companies simply switched to being a massive pipe available to any service provider, including Netflix, they could quickly make enough money to pay off their massive debts. But I'm not betting that their olfactory senses are still working. Someone asked me just today if we really will need all the bandwidth that fiber offers, with the unspoken inference that DSL and cable modem service seems to be working just fine. I came back to my hotel after dinner and found this article: TimeWarner rolled out its new "watch TV on your iPad" service and it's network was promptly overwhelmed by people who thought, "Hey, what a great idea...just what I have been waiting for." The cable giant had to cut back the number of channels available to just fifteen (cut 50% from the original 30). So anyone who thinks 1950s-based copper networks are just fine, the second biggest cable company in the country had its network crashed by a very small number of iPad owners. What happens when everyone tries to watch TV on a tablet device? And no, DOCSIS 3.0 is not the answer to that question. Symmetric, active Ethernet fiber networks are the answer. We will probably not know the full story of the nuclear reactor problems in Japan for many months, but one news story I read over the weekend suggests that the the Japanese are re-learning the lessons of the Katrina disaster. Apparently the Japanese reactors survived the initial earthquake and tsunami without much damage--but whatever was damaged caused the primary cooling pumps to fail. No big deal, as nuclear power plants have extensive back up and redundant secondary cooling systems designed to take over if the primary cooling system fails. If the primary cooling system fails, the reactor is usually shutdown immediately, meaning no electric power. Even when the control rods are in, heat can continue to be generated for some time, hence the need for secondary cooling. So here is the scenario. Primary cooling fails. The reactor is shut down, and secondary backup cooling systems are activated. Apparently all this happened just as it was supposed to immediately after the earthquake and tsunami. The secondary cooling pumps are powered by large diesel generators, which apparently ran for about an hour, then shut down. Why did they shut down? The fuel was contaminated by seawater. So what was the lesson of Katrina the Japanese missed? In the New Orleans area, many telecom, radio, TV, and computer installations were thoughtfully built on upper floors of buildings so that they would be immune from flooding. But the generators and fuel tanks that were supposed to power all those systems in the event of a power outage were all installed at ground level, because it costs more money to put heavy, loud generators and diesel fuel on an upper floor. So the hurricane winds blew down power poles and the power went out first. No problem. Emergency generators started up, and everything kept running. Until the water came and flooded and the fuel tanks and generators. One small ISP in downtown New Orleans stayed up and running throughout the entire flood because they had installed a generator on an upper floor. They managed to truck in 55 gallon barrels of diesel fuel once their initial supply ran out. How is your community's disaster recovery plans? Many areas of the U.S. are flood prone, but everywhere I go, I see generators now--which were very rare ten years ago. But those generators are all on the ground. Is that okay for your area? What about a ten year flood? What about a 100 year flood? Here is a study that indicates that smaller communities with the right broadband infrastructure are "...emerging as major economic centers." What about your community? Does it have the infrastructure to attract new businesses? The first iteration of the National Broadband Map is now available. This effort has been part of the broadband stimulus effort, and it will be updated regularly over the next three to four years as individual states provide more data to NTIA. The map zooms nicely, so you can get a pretty good local picture of what technology is available, and you can select which technologies you want to look at (e.g. 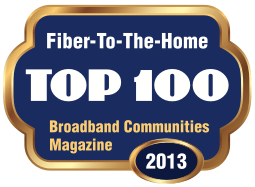 fiber to the home, cable modem, wireless, etc.). With the exception of mobile wireless (i.e. cellular), you can quickly see that most of rural America is still poorly connected or not connected at all. What is particularly surprising is how few areas have high speed cable modem service (called DOCSIS 3.0). It is much less available than I expected. Oh, and Mac users.....this does not work with Safari, but Firefox is okay. "This is like electricity was....This is a critical utility"
Virginia Tech has an excellent speed test. Try it and see how your connection rates. The tiny Isle of Jersey will be getting Gigabit fiber to the home as part of an initiative by the incumbent Jersey Telecom to replace all copper-based services with fiber over the next five years. Maybe some U.S. incumbents should make a trip to Jersey (in the English Channel just off the coast of France) to learn how to construct a business case that allows dumping 100 year old copper technology for something a little newer. Bob Frankston, who is smart enough to know why X.400 never worked the way the policy wonks thought it would, has an excellent and very readable short paper called Demystifying Networking that is one of the best overviews I have read on broadband, where we came from, and where we want to go. Take a few minutes and read it in its entirety. A short note on the Google blog indicates that the community to be selected for the Google fiber opportunity won't be announced until "early 2011." Skype has announced a new record of 25 million concurrent users, meaning 25 million voice and video calls simultaneously. It also means that all those Skype users are NOT using their cellphones or land lines to make voice calls. Skype video works extremely well if you have a good Web camera (good means you ought to spend at least $50-$75) and a decent Internet connection; if you have tried Skype video and found it fuzzy or blurry, it's probably your camera. The tiny cameras that come in laptop lids tend to have very poor quality compared to a good USB camera. But I digress. Those video calls that Skype users are making are stressing out the "entertainment" networks provided by the cable and phone companies. I put "entertainment" in quotes because years ago, when I was working out of the home and suffered a cable modem network outage, I was told that the cable modem service I was subscribed to was an "entertainment" service, not a business service, and it might take up to two weeks to repair the outage. Today's cable and DSL networks were not designed to support symmetric bandwidth, which is what you need if you are going to do voice and video calls--especially if you are trying to do video calls. But wait, I've saved the best for last. Think just a few geeks are using the Skype video service? You'd be wrong, because Skype says 40% of their calls in the first half of 2010 were video, not voice. Ruh-roh, as Scooby Doo would say, or perhaps the cable companies and phone companies are saying..."Ruh-roh...our networks are glowing cherry red, we can't supply the bandwidth, we have an antiquated network and a 1950s business model." This is going to become a national disaster before it is over, because the economic development plans of many communities are going to be disrupted over lack of decent bandwidth to run a business. The communities that are building their own open access networks will have complete control of their economic future. If your community's essential infrastructure for attracting and retaining businesses depends on the cable and phone companies, you might want to practice saying, "Ruh-roh."